Robin Rue Simmons speaks at a candidate forum on Jan. 19. She and Carolyn Murray, seated second from the left, will face off in the general election on April 4. 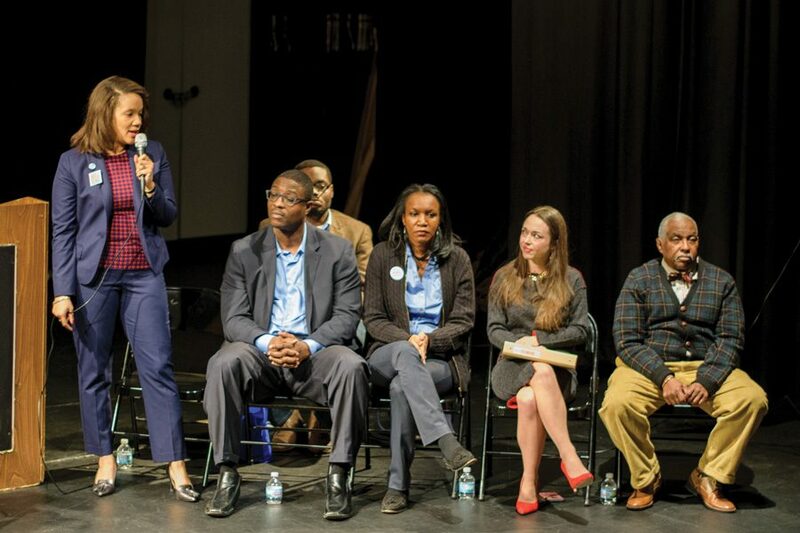 As a lawsuit and allegations of ethics violations hover over the 5th Ward aldermanic election, the two candidates emphasize their commitments to promote affordable housing and economic development. The two candidates in the race are Robin Rue Simmons, who has worked for Sunshine Enterprises on small business development, and Carolyn Murray, a longtime gun control activist. The two advanced from the February primary, in which Simmons earned more than 50 percent of the vote and Murray finished with 21 percent. Ald. Delores Holmes (5th) will not be running for reelection. In February, she endorsed Simmons for the position in a statement sent to residents of the ward. At the time of her endorsement of Simmons, Holmes told The Daily that she was impressed with Simmons’ regular attendance at ward and council meetings, as well as her work with Sunshine Enterprises, which provides training in business management and development to local entrepreneurs. Throughout the race, residents have raised concerns of ethics violations regarding Holmes’ endorsement of Simmons, which she sent out using her official city email. A lawsuit was also filed against Simmons when two 5th Ward residents, Sophia and Thomas Jenkins, sued Simmons over allegedly abandoning a home-renovation contract. The lawsuit concerned renovations Simmons had been hired to perform on their house in 2012, when she owned now-defunct construction company Signature Construction Services, Inc. The company was involuntarily dissolved in 2014, according to state documents. The lawsuit asks for Simmons to pay nearly $65,000 in damages. Simmons said she saw the lawsuit as a “political hit,” because of its filing so close to the election. Thomas Jenkins said he and Sophia Jenkins could not file the lawsuit until recently because they did not have enough money saved to do so. Over the course of the campaign, both candidates have been vocal in calling for more affordable housing and economic development in the ward. Murray said she wants to reinstate the “first-time buyer program,” which was designed to help individuals purchase their first house in Evanston. Illinois still has a similar program in effect, which combines a 30-year fixed rate mortgage with a $7,500 down payment assistance grant. “The first-time buyer program, a program I benefitted from when I bought my house over 15 years ago, is no longer existent,” Murray said at a forum earlier in the campaign. Simmons has said she wants to increase access to affordable housing, especially for seniors. Additionally, she has expressed interest in improving the parks in the ward after the city released its Parks Scorecard at the end of last year. Simmons said she would plan to focus on environmental protections in the ward and expand its business districts to support entrepreneurs and small businesses by increasing jobs and small business support in the ward. She added that she plans to look at redistributing funds for affordable housing support to increase homeownership. Murray said she wants to expand workforce development through initiatives like skill training, and provide seniors with access to housing and safety services. Simmons and Murray will face off in the general election on April 4.